Ceramic Style C9 retro fit LED bulbs have the traditional look of opaque bulbs, but with the benefits of LED technology. 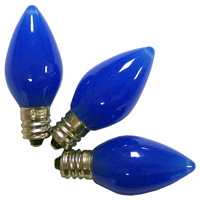 These bulbs are made from a high quality plastic that prevents easy breakage and color chipping. You can mix and match your favorite colors to create a truly unique display. These bulbs are dimmable and are for use with E17 sockets.